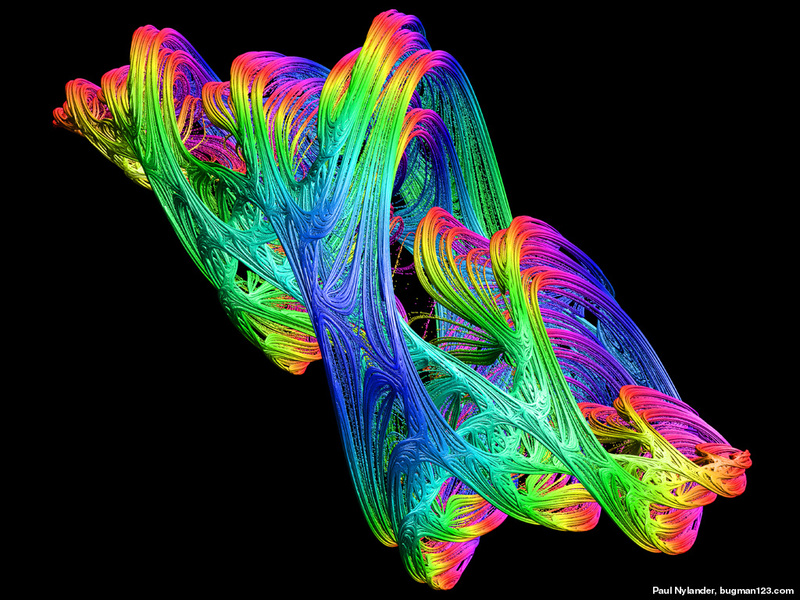 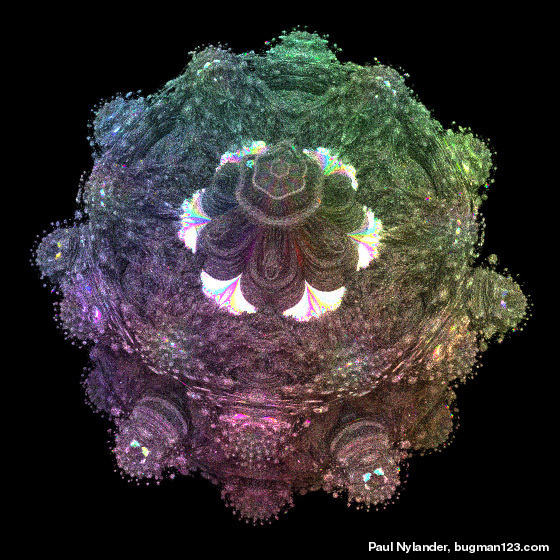 Hypercomplex numbers are similar to the usual 2D complex numbers, except they can be extended to 3 dimensions or more. 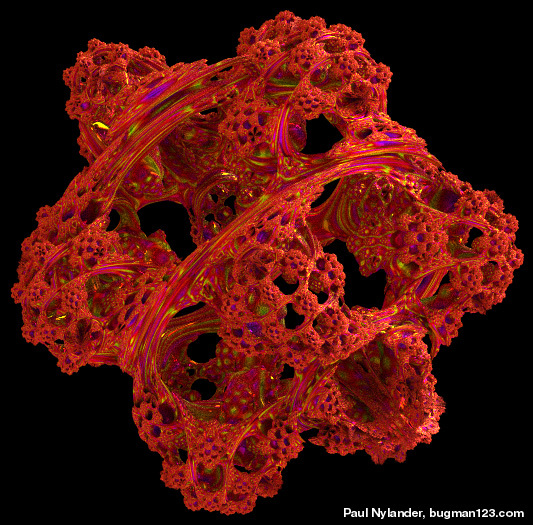 When you use hypercomplex numbers to generate fractals, you can create some interesting looking 3D fractals. 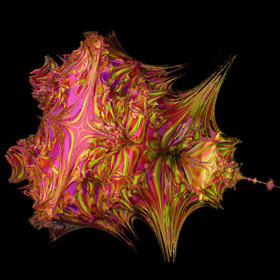 When I first set out to render these fractals, I couldn't find any software that could ray-trace iterated isosurfaces so I had to write my own C++ program for it. At first, this seemed like a daunting task, but with some help from Thomas Ludwig, and some useful links, it turned out not to be as difficult as I thought. 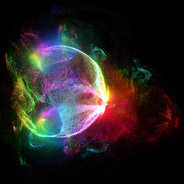 I made the top image using a volumetric technique described by Krzysztof Marczak. 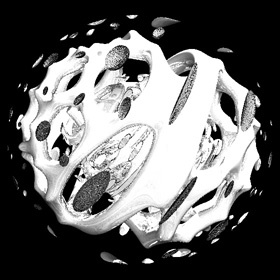 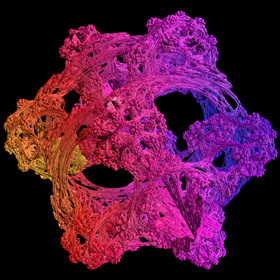 This image was precomputed using a volume of 1.4 billion voxels. 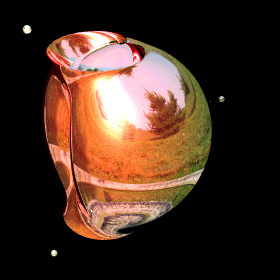 I made the other images using James Kajiya's path tracing method for Global Illumination (GI). 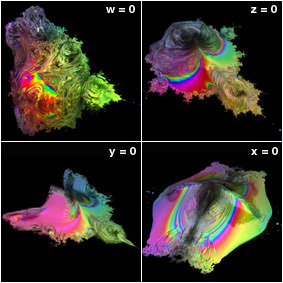 This method uses Monte Carlo integration to solve the rendering equation. 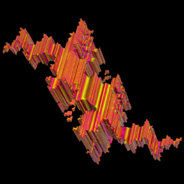 I posted some non-trigonometric expansions for this formula here and here. 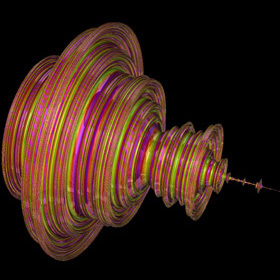 The above animation was created by adding a phase shift to φ. The left image is a 3D Julia set based on Daniel White's squarring formula for squaring a 3D hypercomplex number (or "Juliabulb" set). 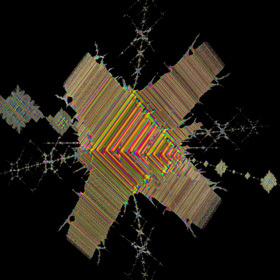 The right image is the 4th order variation. Here are some higher order variations of this fractal. 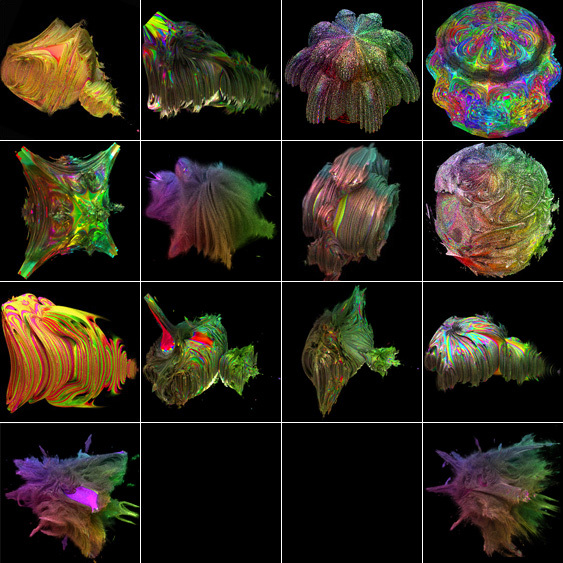 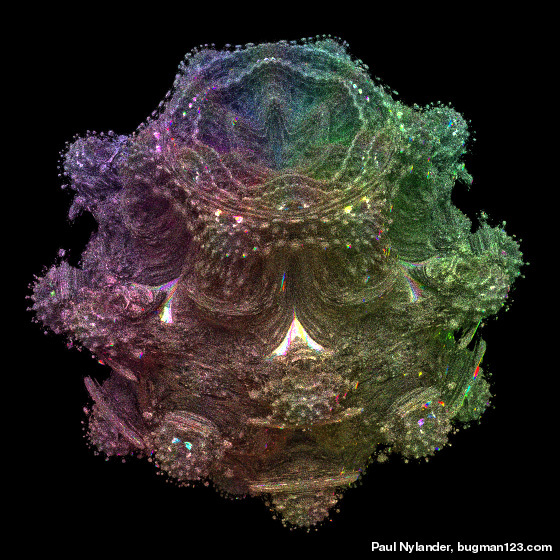 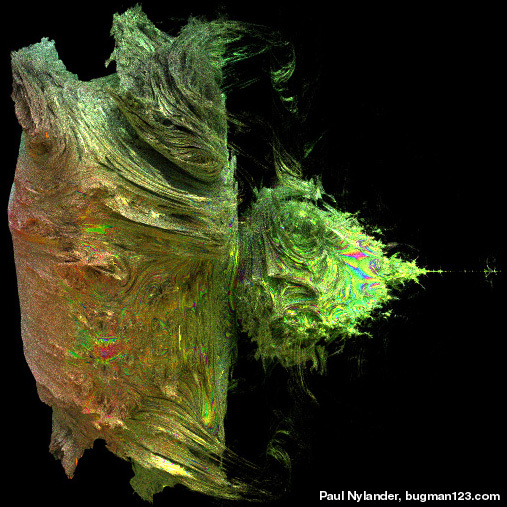 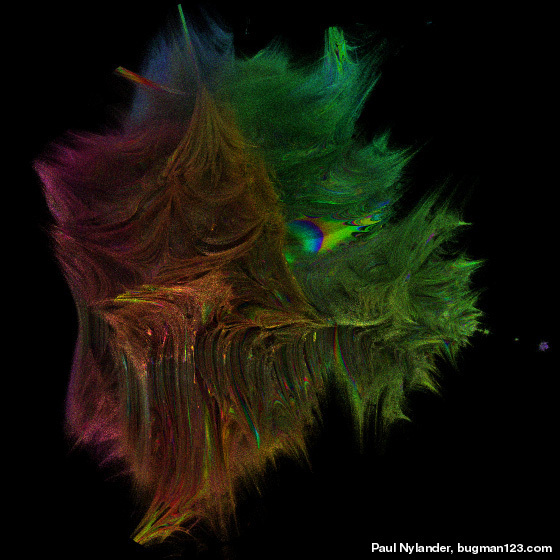 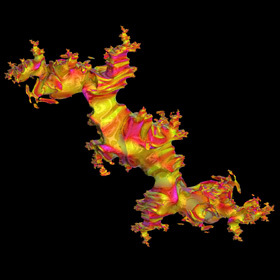 Here are some Pickover stalks using other 3D Mandelbrot formulas. Quaternions are 4D hypercomplex numbers, discovered in 1843 by Sir William Rowan Hamilton. They are mathematically elegant, but unfortunately, they produce rather boring looking axisymmetric results when used to calculate the 3D Mandelbrot set. 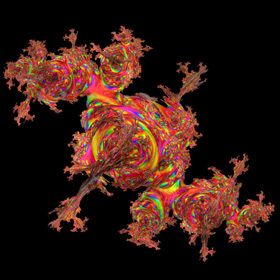 The image in the middle is a zoom of the first miniature Mandelbrot set and the image on the far right shows the 8th order variation of this fractal. 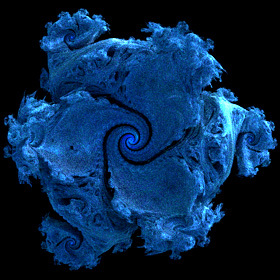 Here are the orbits of the quaternion Mandelbrot set. 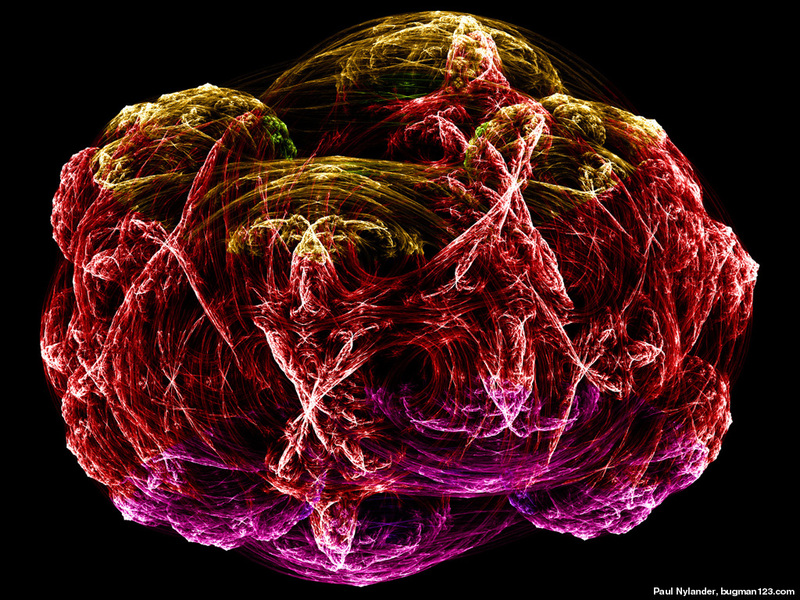 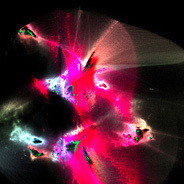 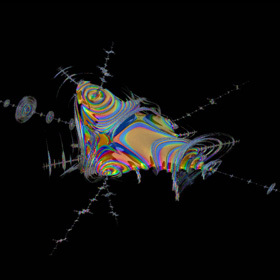 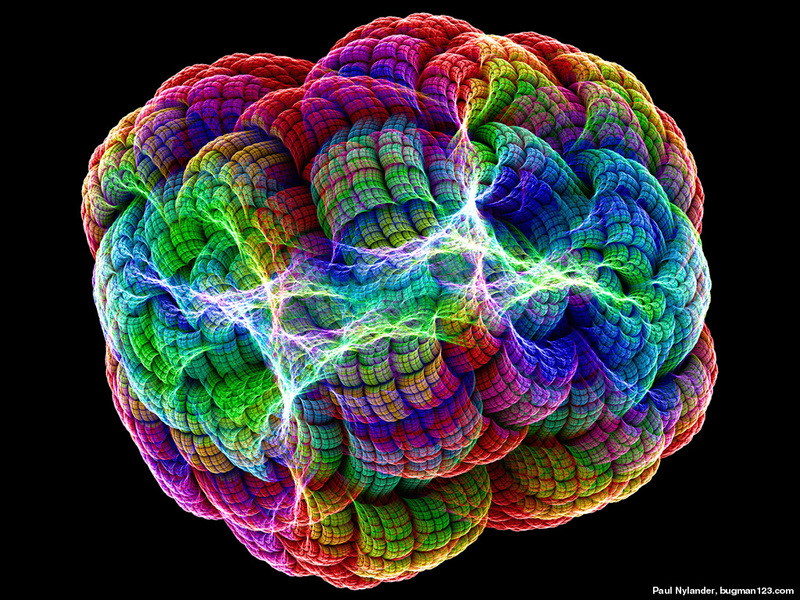 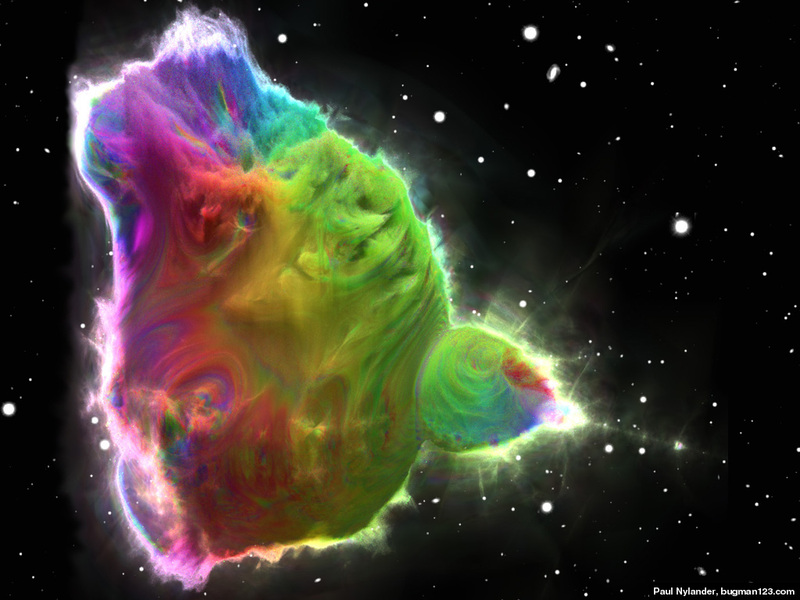 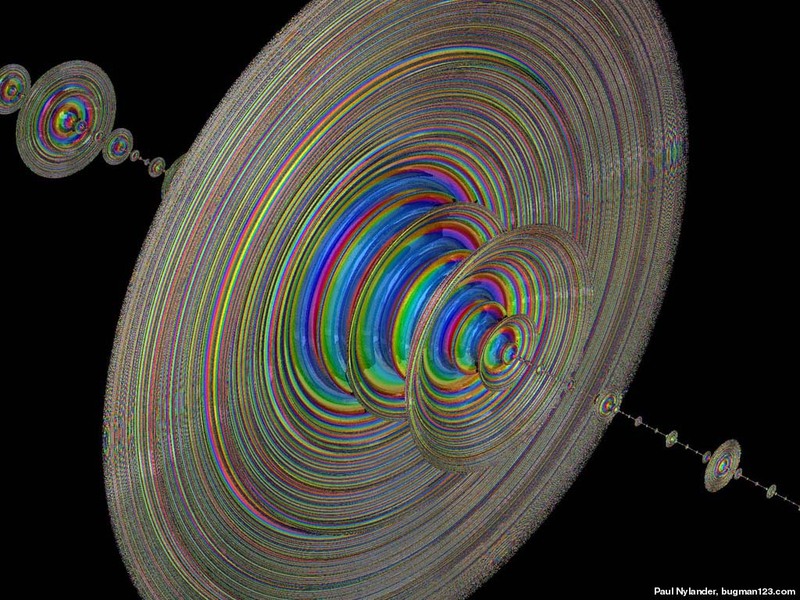 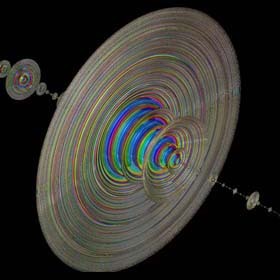 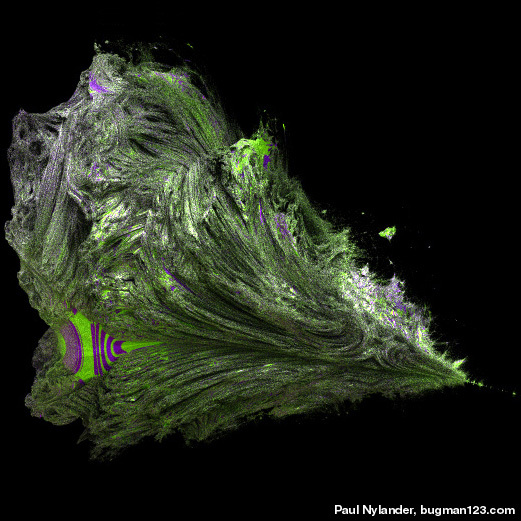 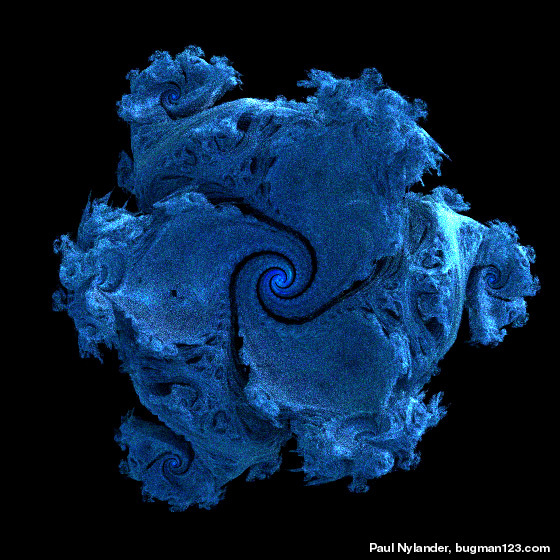 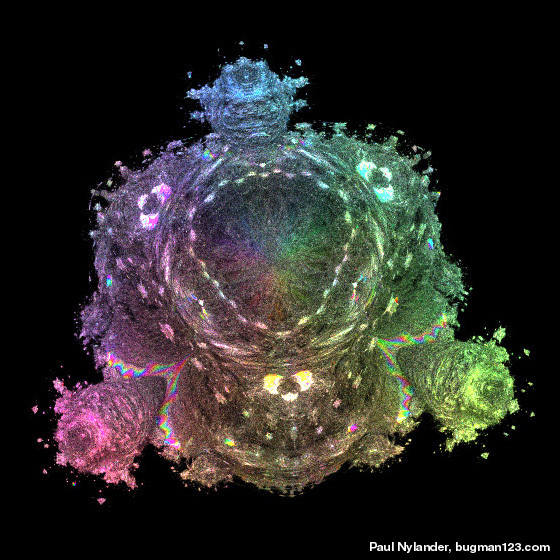 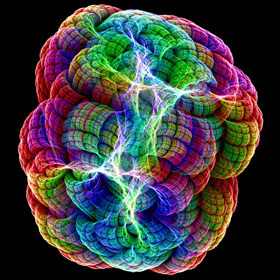 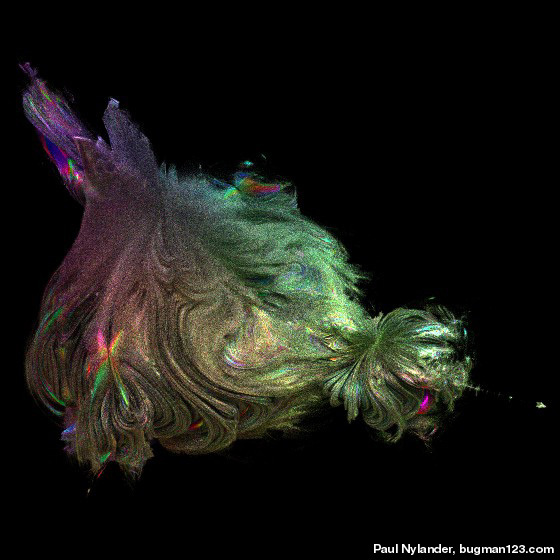 This image was created by simply revolving the 2D Mandelbrot orbits. 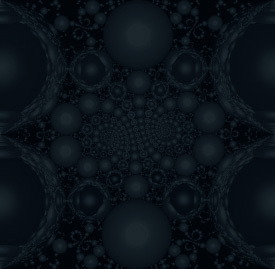 Here is a 4th order inverse Juliabulb set with 600 million spheres. 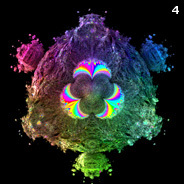 The triplex raised to the 4th power has 16 unique valid roots. 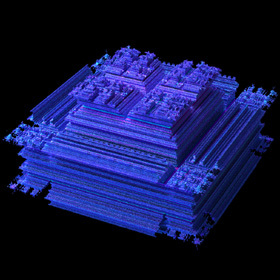 Garth Thornton was the first person to point out that, in general, the triplex raised to the nth power has n2 unique valid roots. 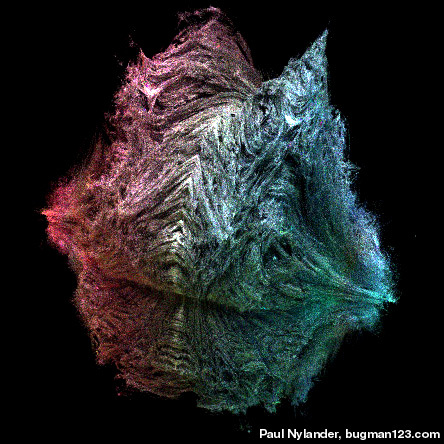 I posted a formula for all integer powers here. 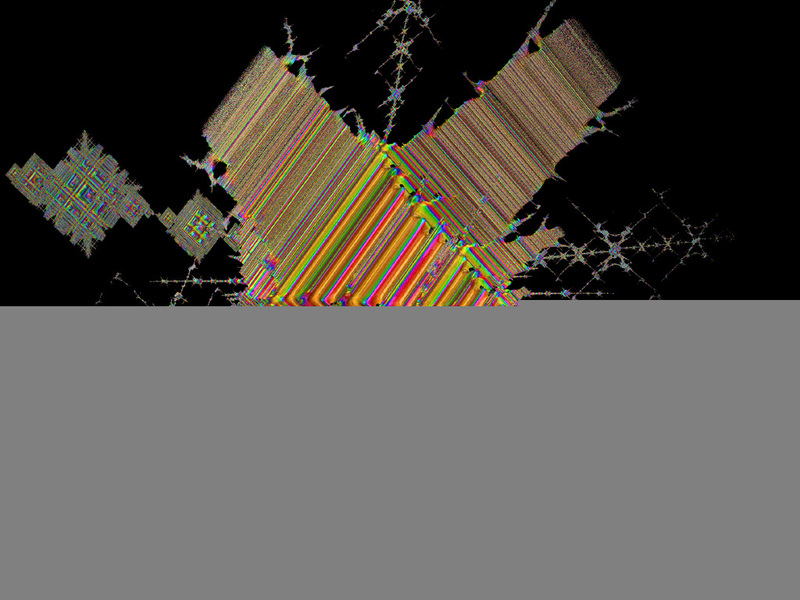 The image on the left is the third order variation of the Tetrabrot set. 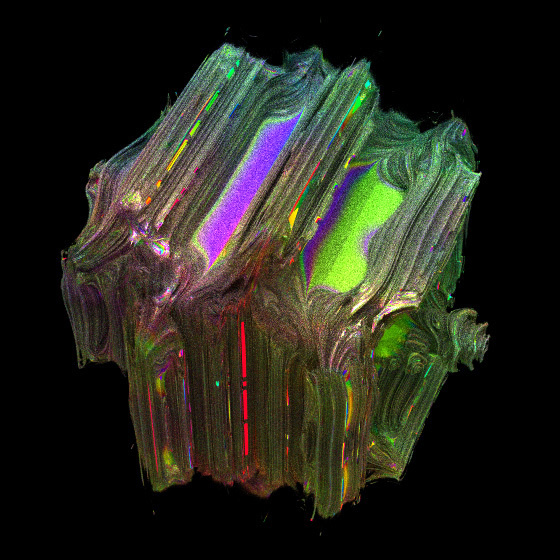 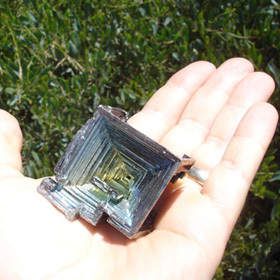 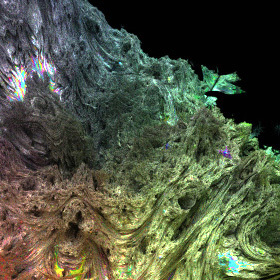 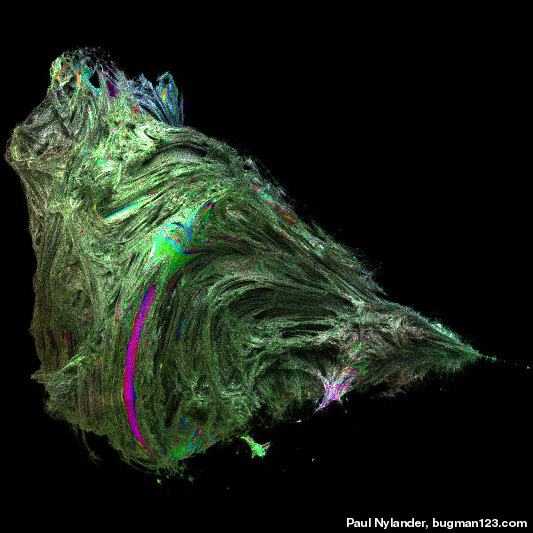 The photo on the right is a Bismuth crystal. 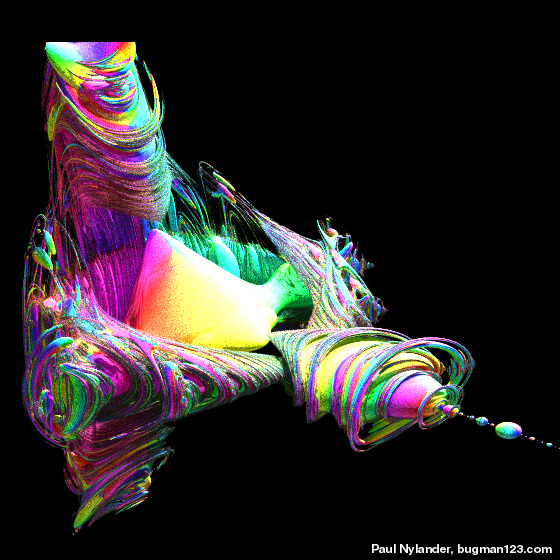 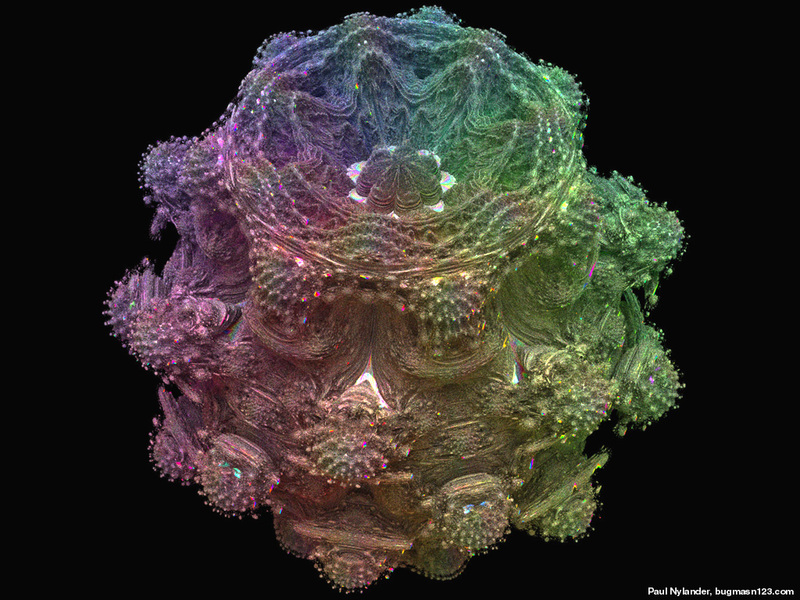 Some people have suggested that the distorted regions of the Mandelbulb set have to do with the poles of the spherical coordinate system. 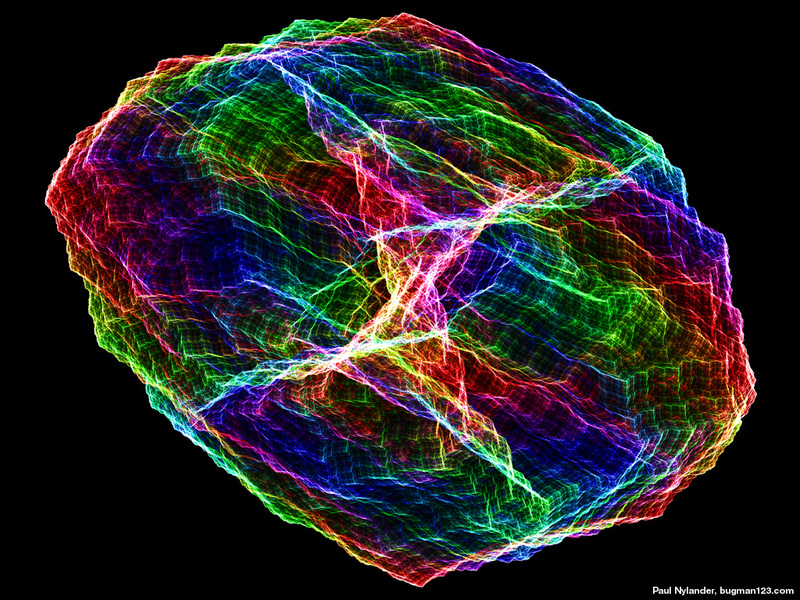 An ideal formula would have no poles, but this is only possible in 4 dimensions (because of the hairy ball theorem). 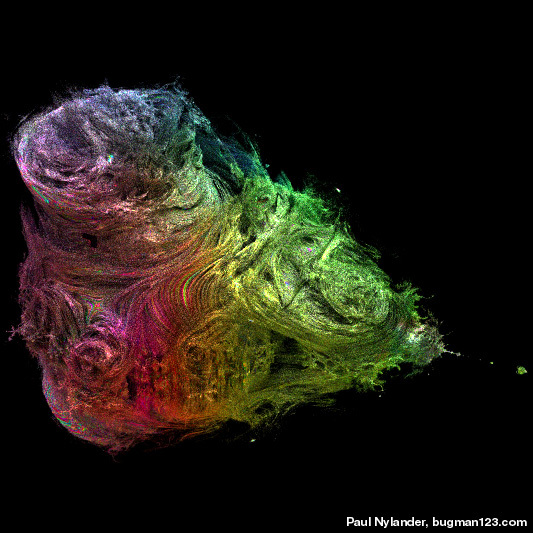 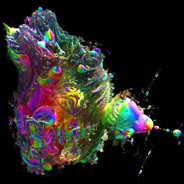 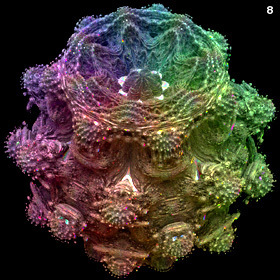 This got me thinking, maybe a less distorted 4D Mandelbrot set could be created using the Hopf map (a mapping for the surface of the 4D sphere with no poles). 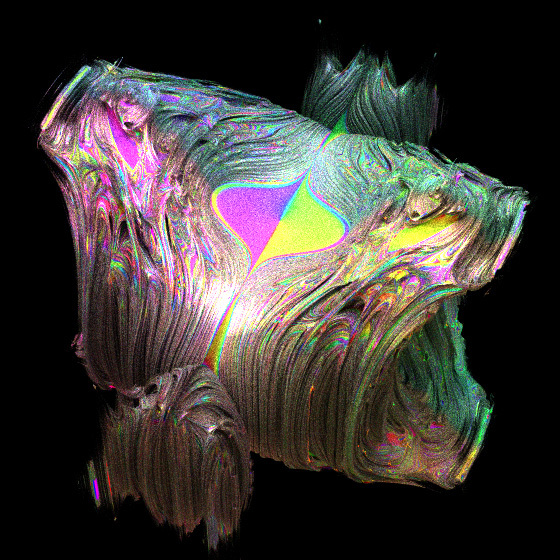 As it turns out, it still has some distorted regions. 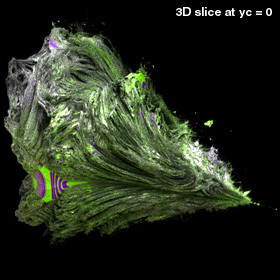 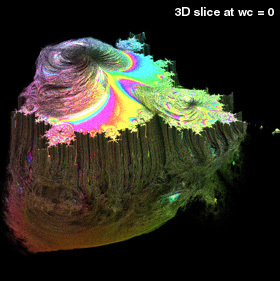 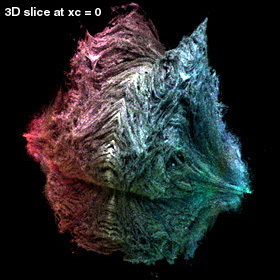 The 3D slice at wc = 0 contains the Mandelbulb set, the 3D slice at zc = 0 looks like it might be worthy of further investigation, the 3D slice at yc = 0 is the Christmas Tree Mandelbrot set, and the 3D slice at xc = 0 is just, weird. 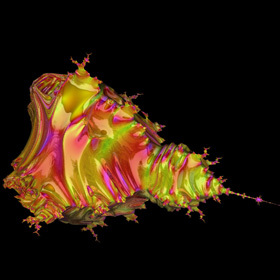 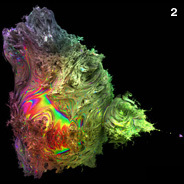 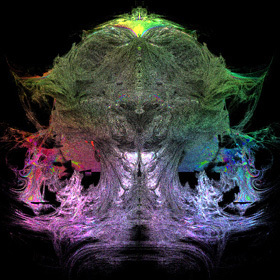 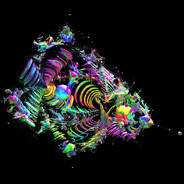 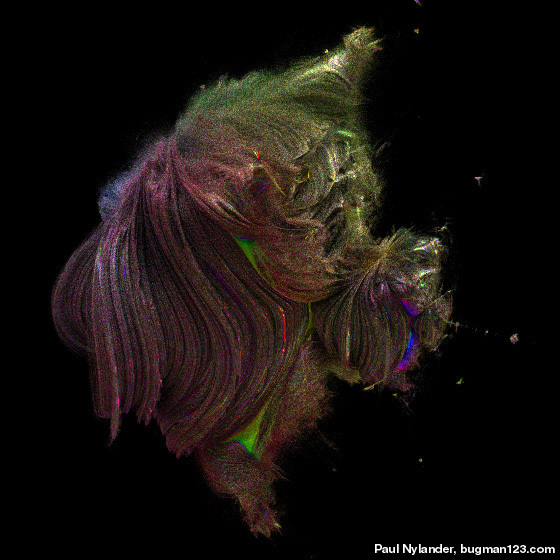 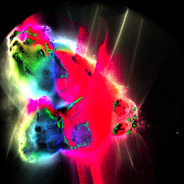 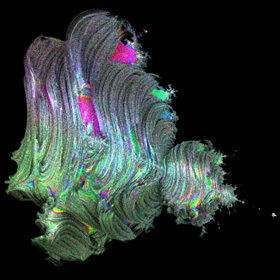 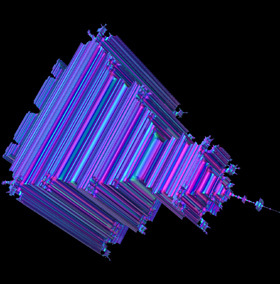 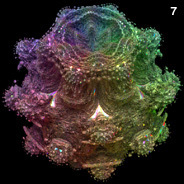 Using this formula, I rendered 3D slices of this 4D Mandelbrot fractal at w = 0, z = 0, y = 0, x = 0. 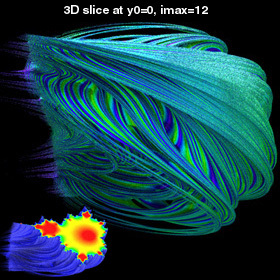 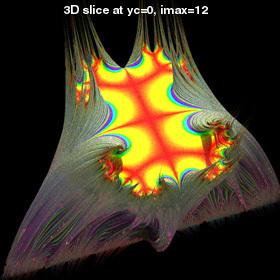 The animation shows the 3D slice starting from w = 0, and then rotating to z = 0, then to y = 0, then to x = 0, and finally back to w = 0 again. 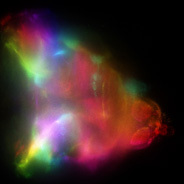 The Nebulabrot is a variation of the Buddhabrot technique. 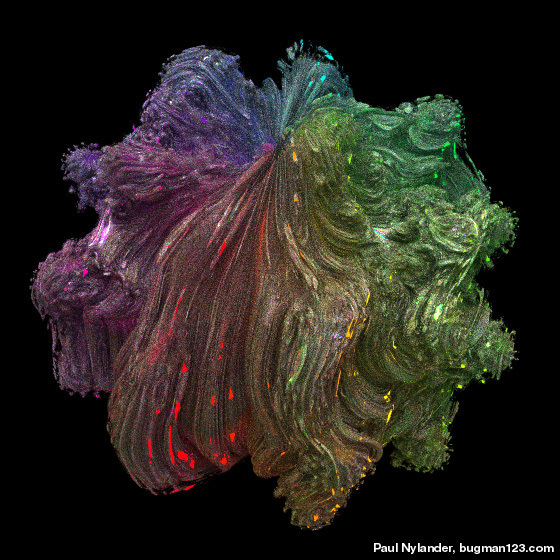 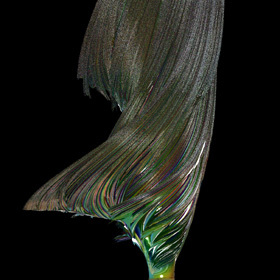 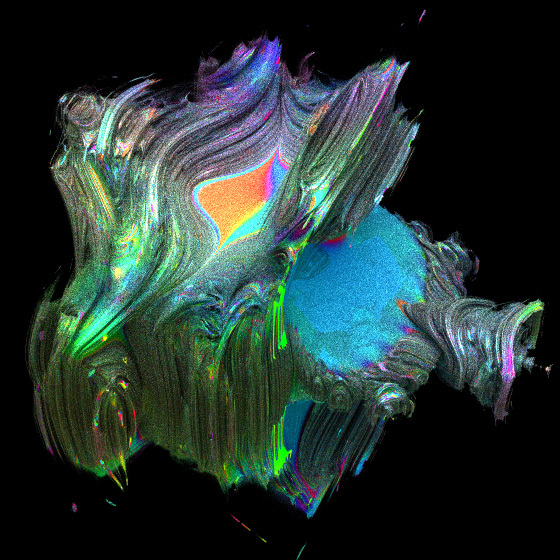 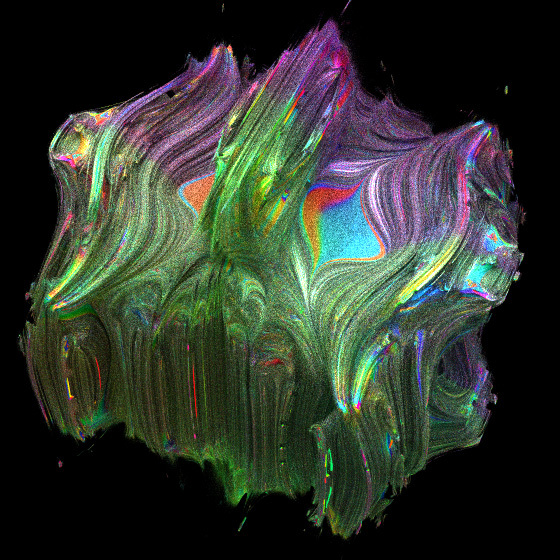 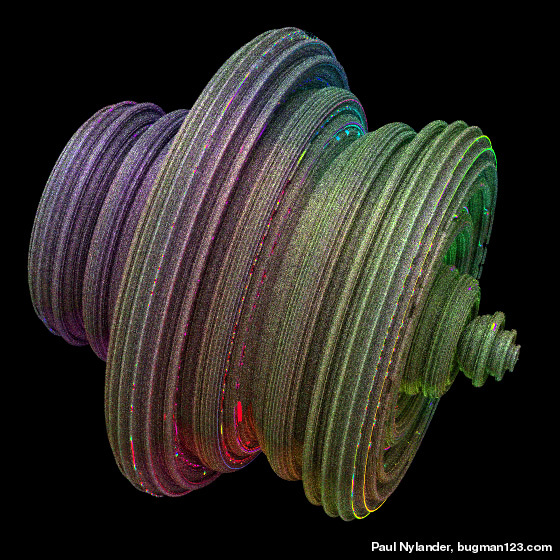 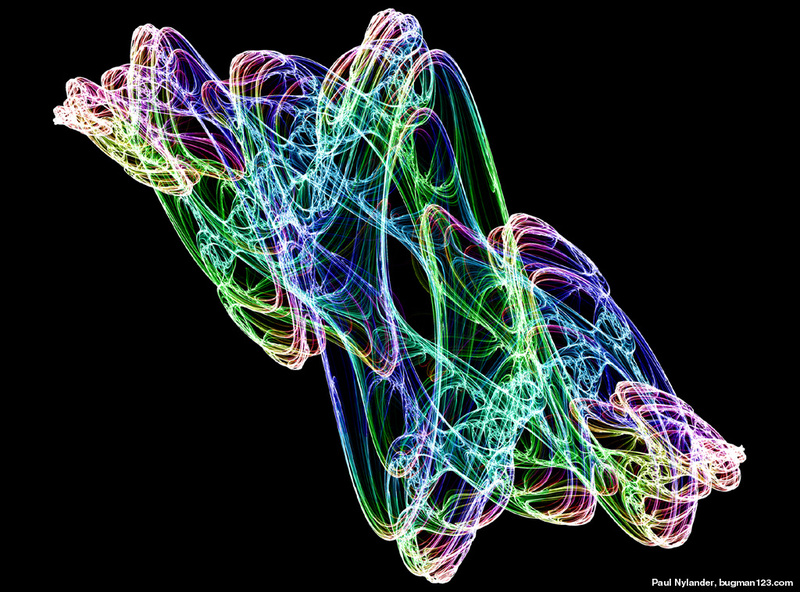 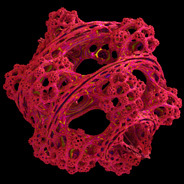 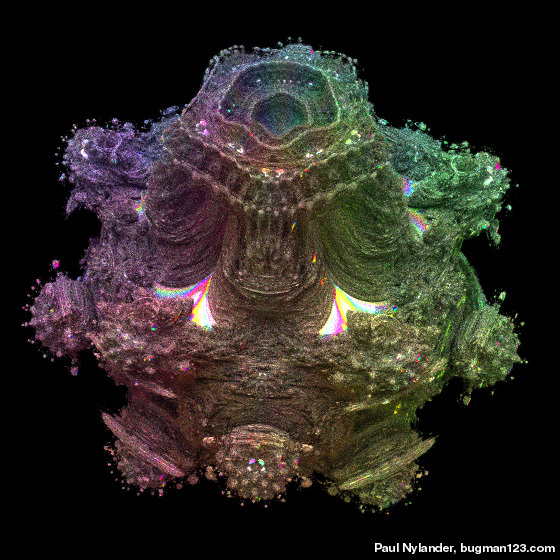 These 3D variations were rendered from 2 billion points each. 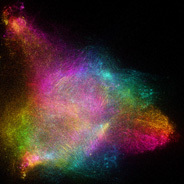 See also my 2D Nebulabrot. 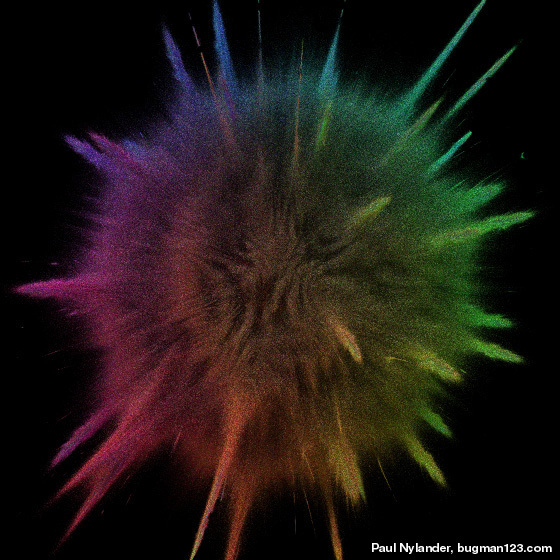 Here are some volumetric renderings. 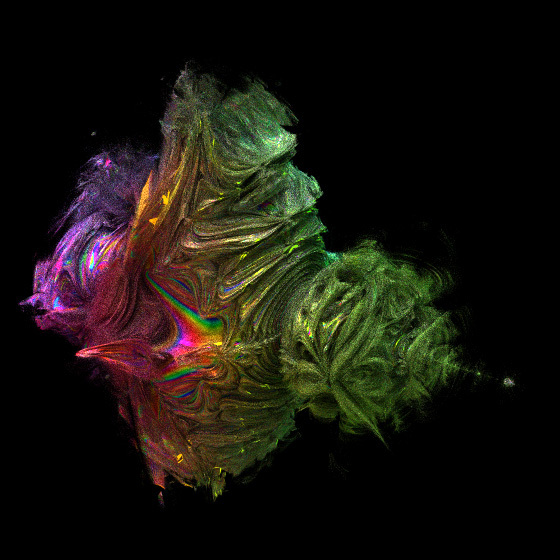 This still has some bugs in it, but I think this will look quite beautiful if I ever get the bugs ironed out. 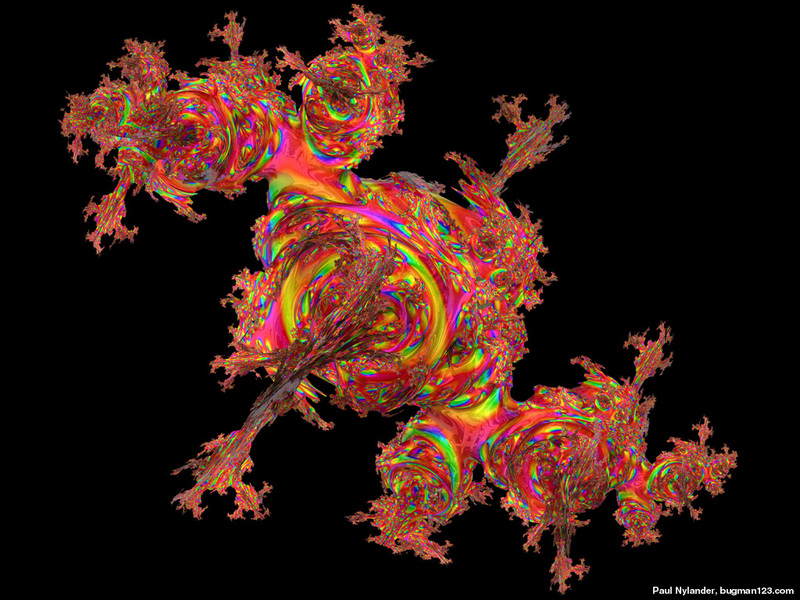 The image on the right shows the 8th order variation of this fractal. 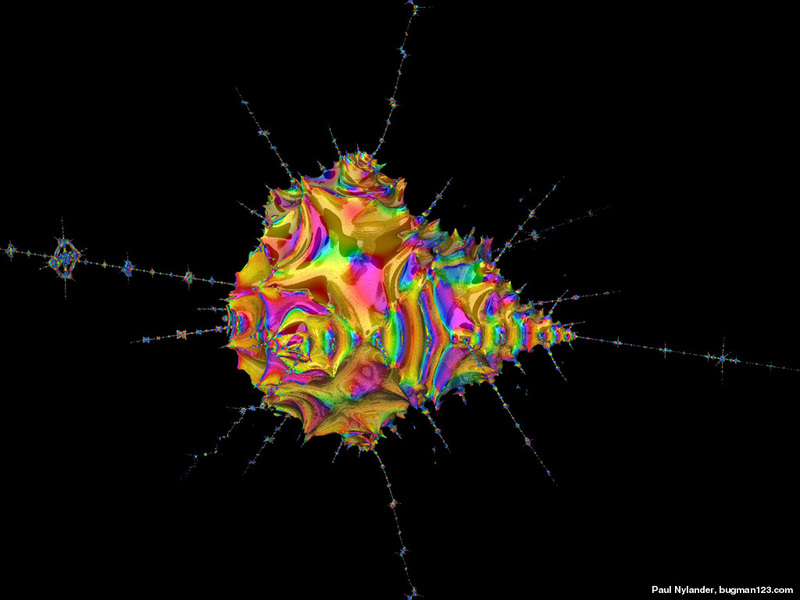 This 3D Mandelbrot set is based on a power formula that travels the same distance around the sphere no matter what the angle. The Cosine method also satisfies this requirement but one advantage of this method is that it reduces to complex arithmetic in the limit when z = 0 and therefore it contains the regular 2D complex Mandelbrot set as a cross-section in the x-y plane. This formula also happens to be identical to the 3D slice at y = 0 of my 4D Hopfbrot formula. 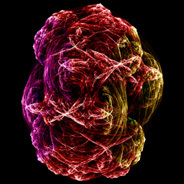 This was my attempt to combine the forward method with a reversed order method. 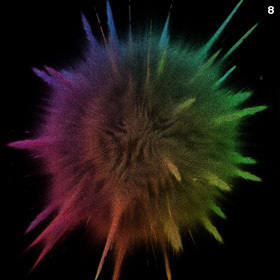 The 8th order version looks like an explosion. 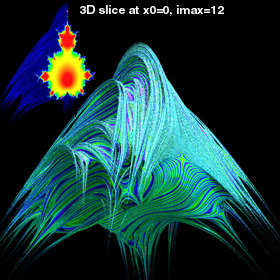 David Makin suggested this formula for squaring a 3D hypercomplex number. 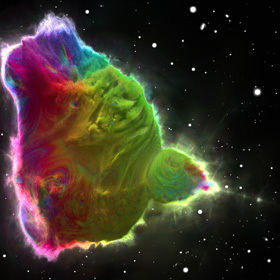 It's kind of similar to the Bristorbrot. 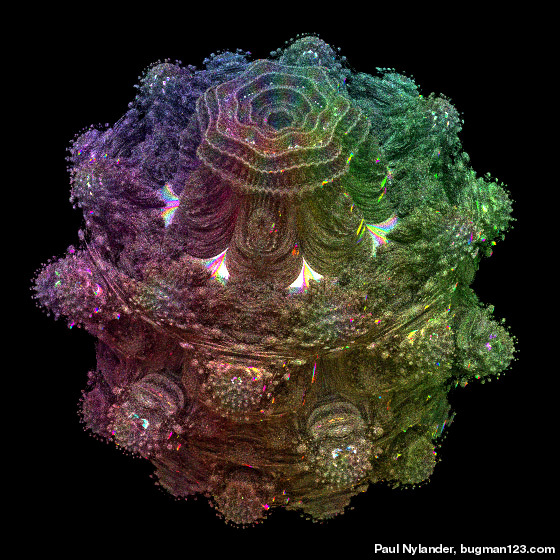 Roger Bagula suggested these strange fractals to me based on Daniel White's squarring formula. 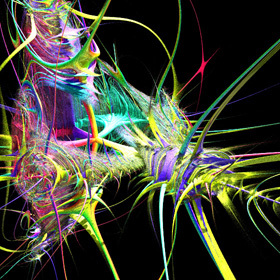 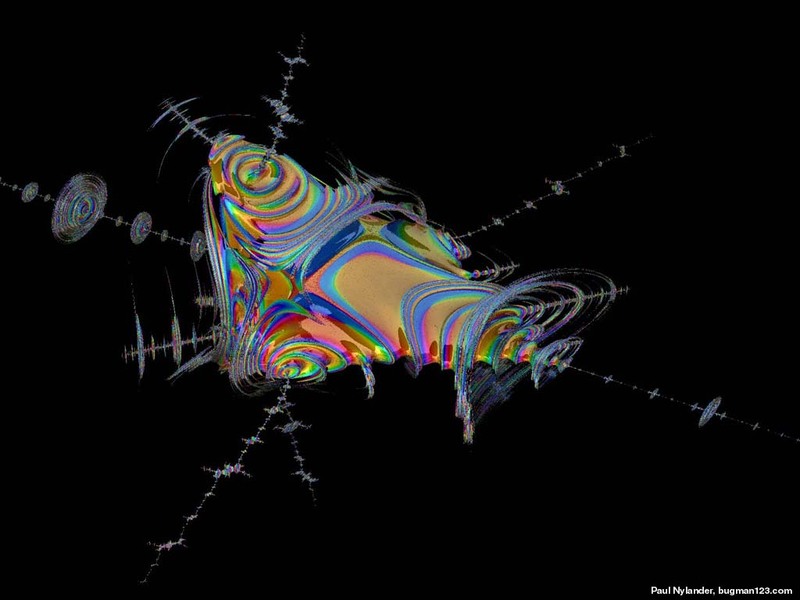 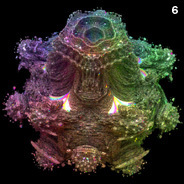 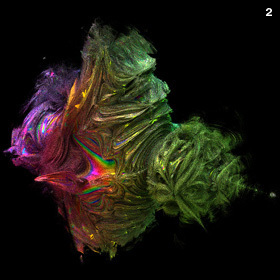 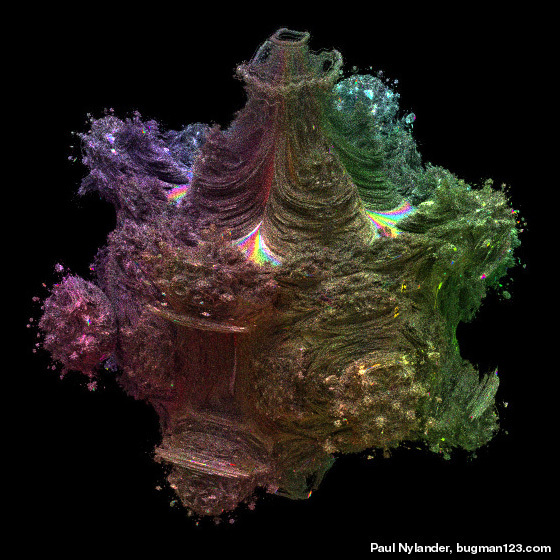 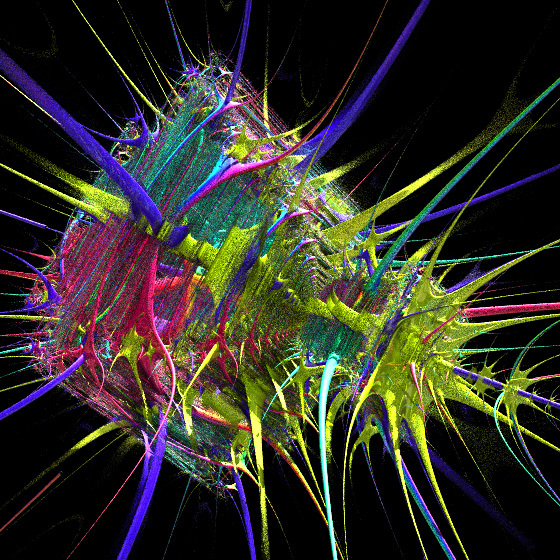 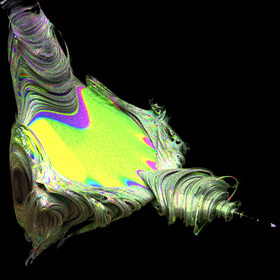 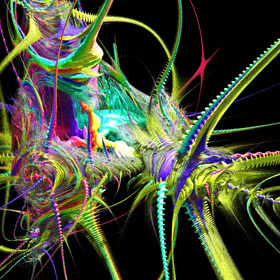 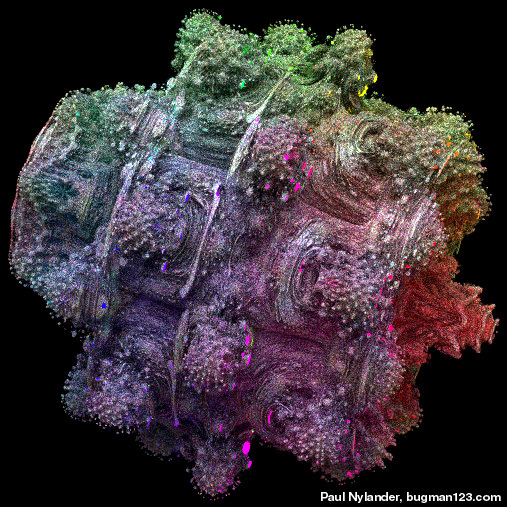 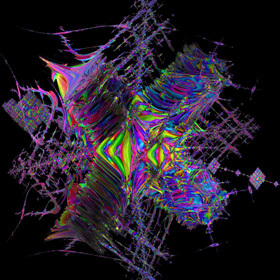 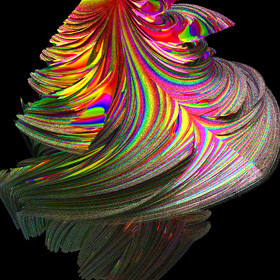 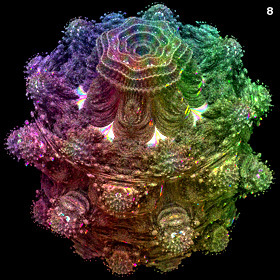 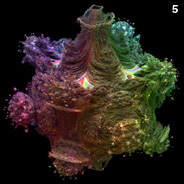 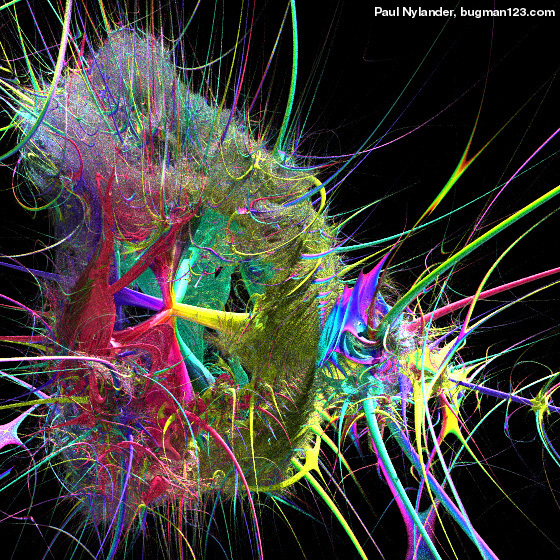 I'm not sure if these would be considered Mandelbulb or Juliabulb sets. 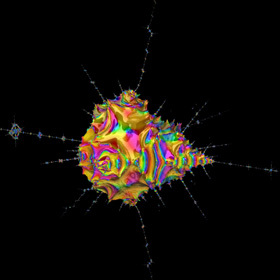 The original Mandelbulb triplex power formula applies the azimuthal angle (φ) rotation away from the azimuthal axis (z-axis). 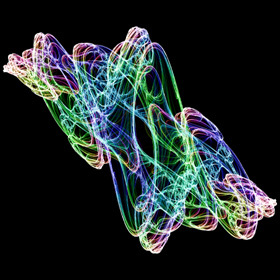 However, one day I got confused and I thought that I had to sandwich the y-axis rotation between an un-rotate / re-rotate pair of transformations. 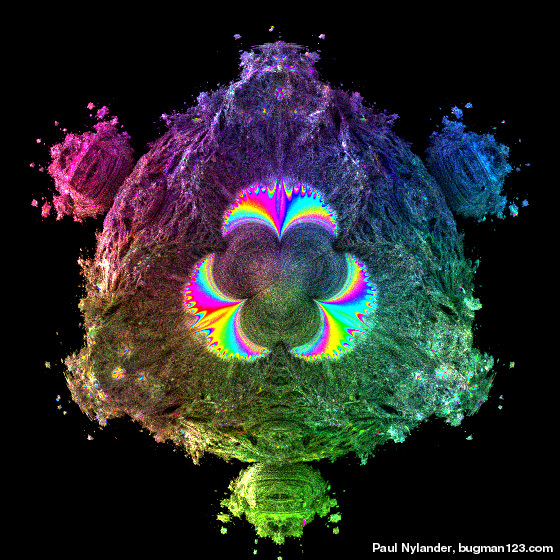 Hence was born this formula. 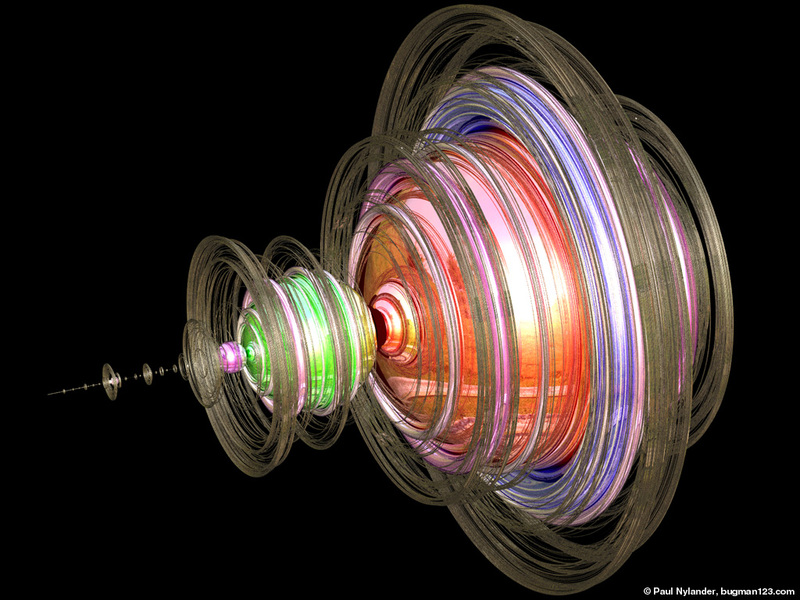 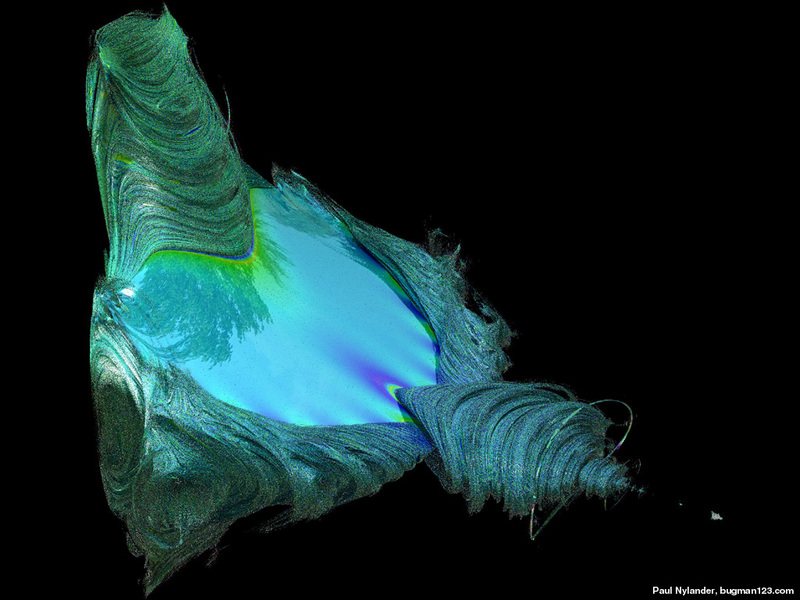 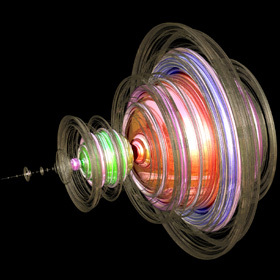 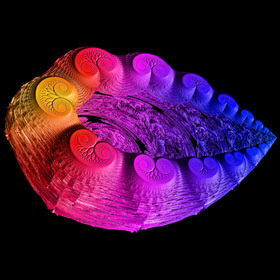 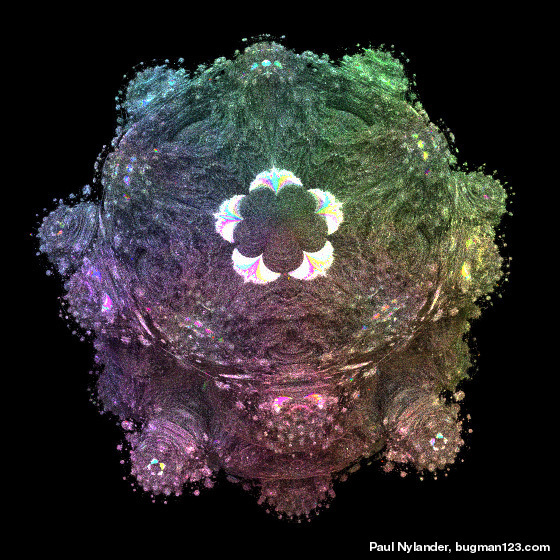 Here is the boundary of the first orbit (3D cardioid) of the Mandelbulb, based on Daniel White's squarring formula. 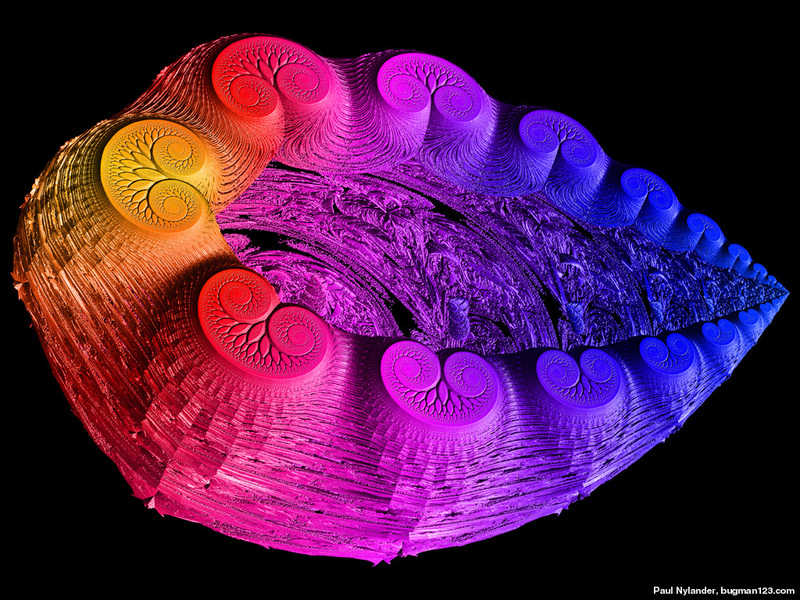 The image also shows the location of 3 roots for finding the second cycle 3D orbits, although I wasn't able to solve for the shape of those orbits. 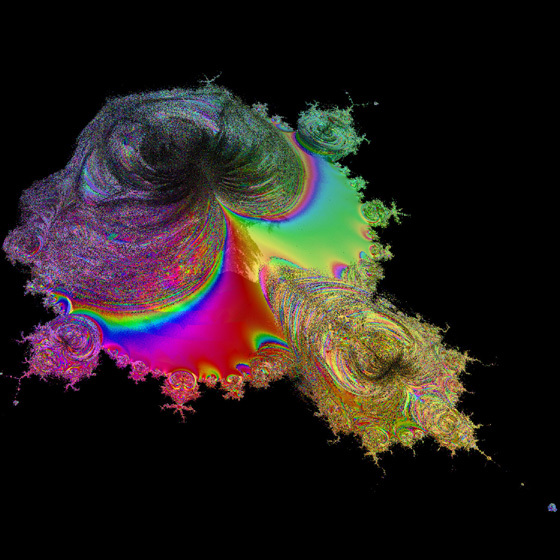 See also my 2D Mandelbrot orbits. 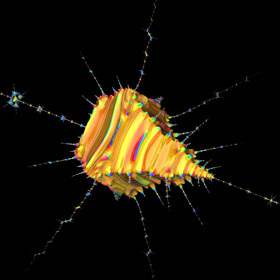 David Makin suggested this formula to me for squaring a 4D hypercomplex number. 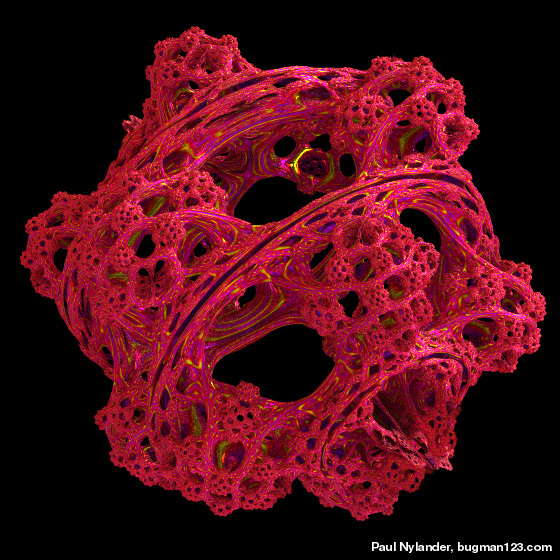 Here is another formula for squaring a 4D hypercomplex number that David Makin suggested to me. Here is an unusal method that Ramiro Perez suggested to me. 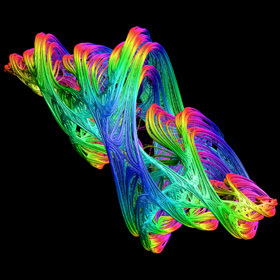 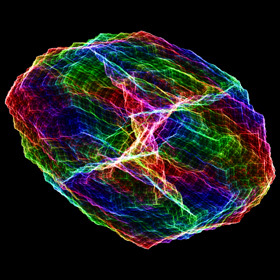 First it maps from a 3D point to a 4D quaternion by using negative and positive sides of tetrahedral space. 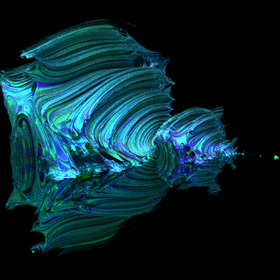 Then it calculates the Julia set using quaternion math. 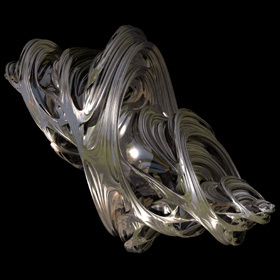 Then it maps the final 4D quaternion back to a 3D point using quadrays. 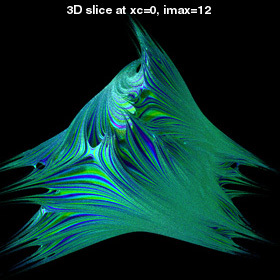 Finally, it applies an isosurface function to the resulting 3D point. 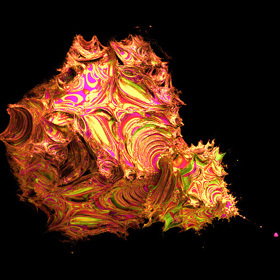 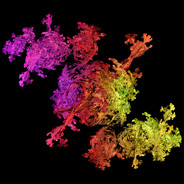 Here are some other weird looking hypercomplex fractals that I made while experimenting with different formulas. 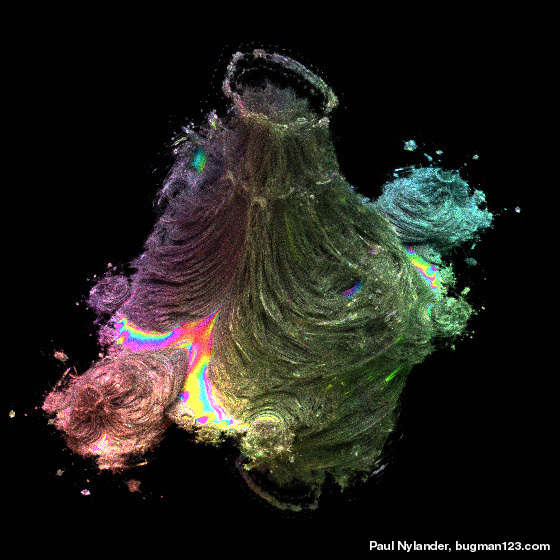 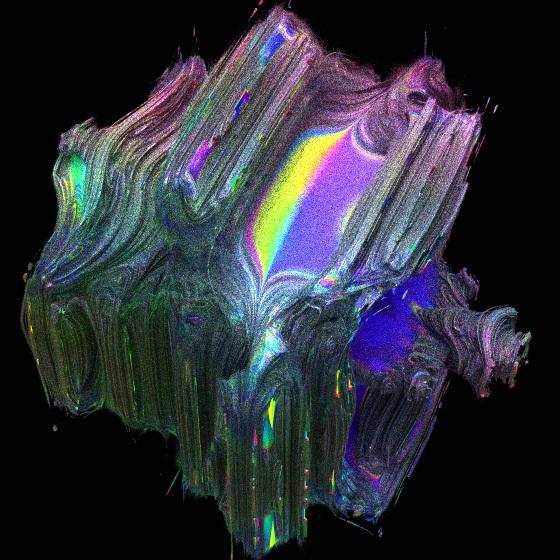 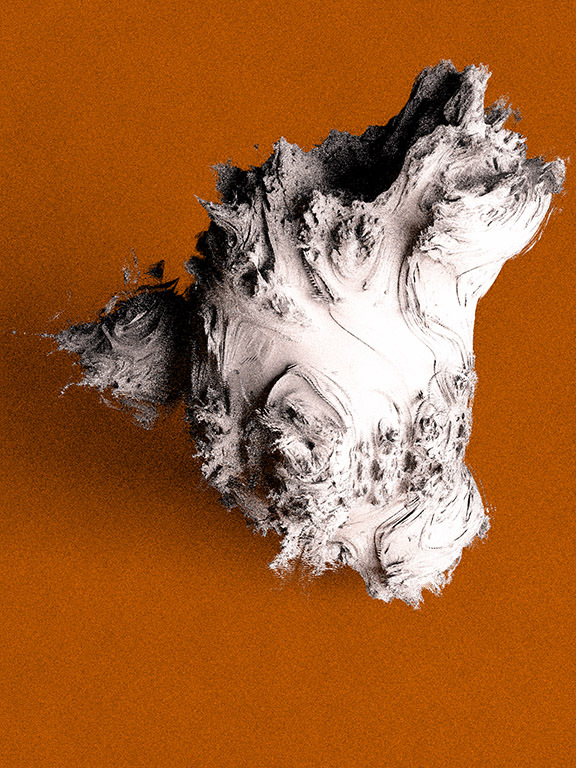 The possibilities are endless, but the challenge is to find formulas that produce intricate 3D details without looking like stretched out taffy. 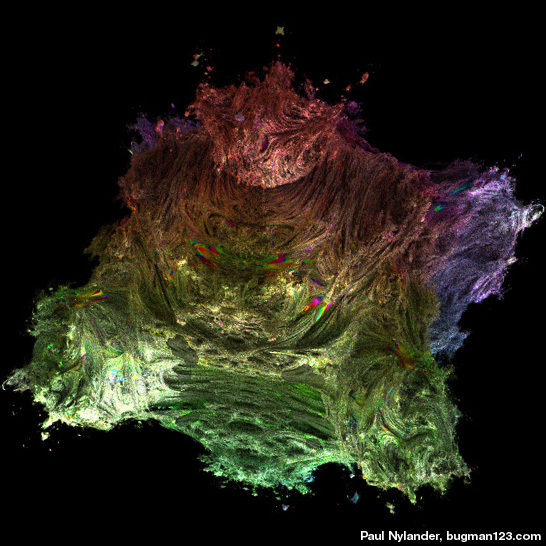 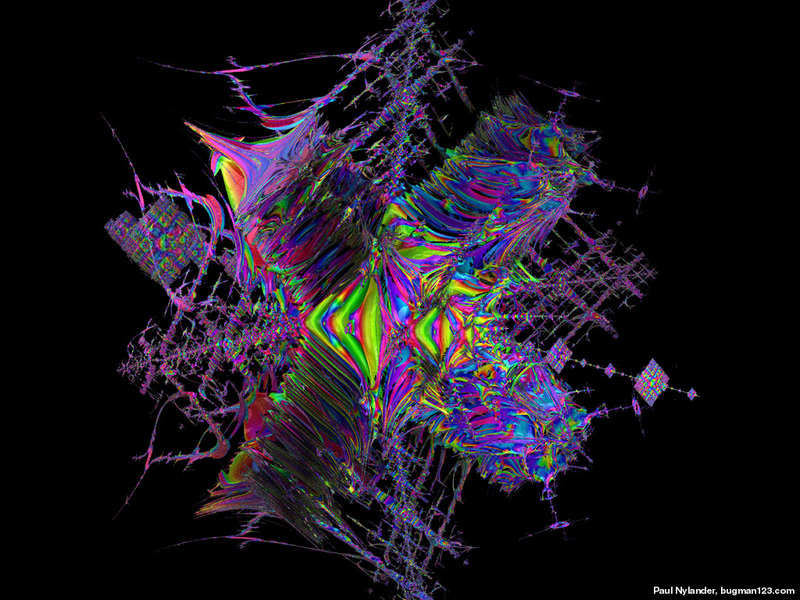 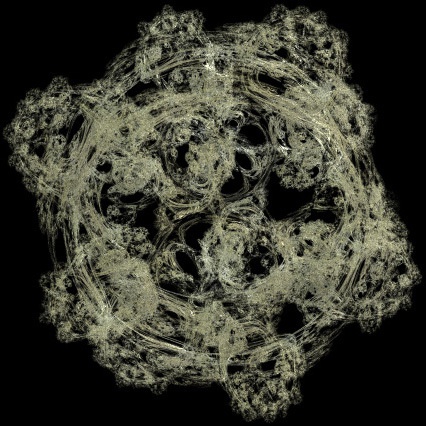 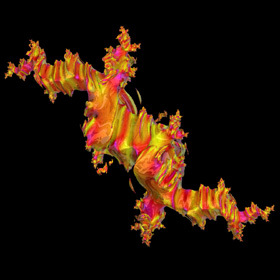 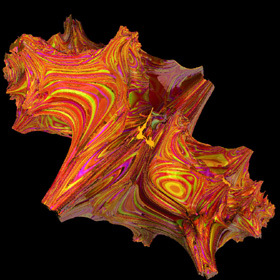 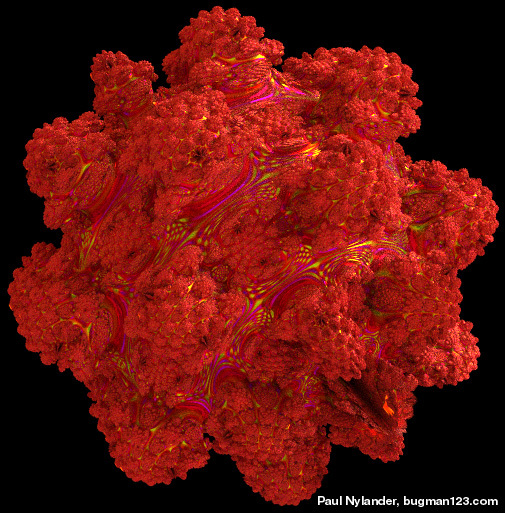 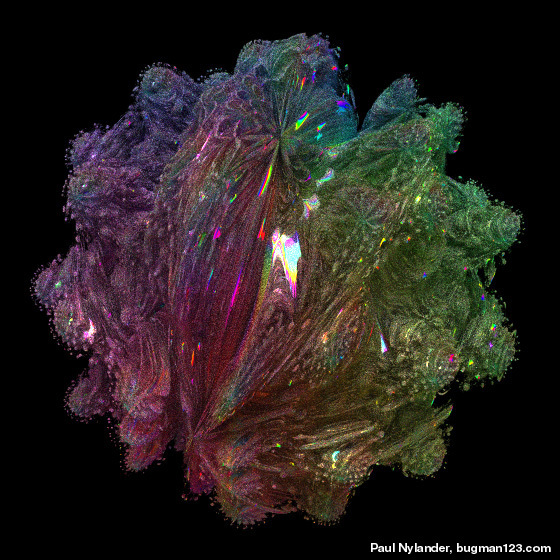 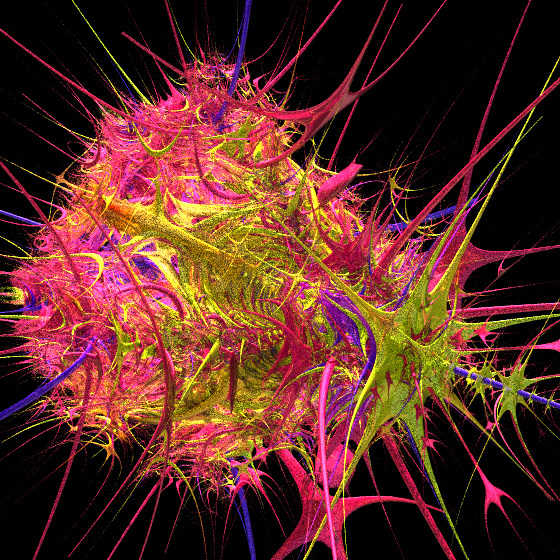 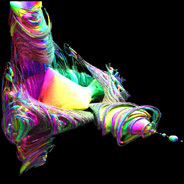 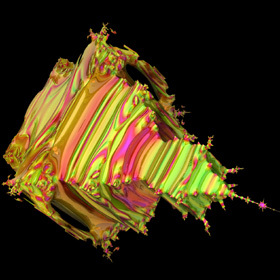 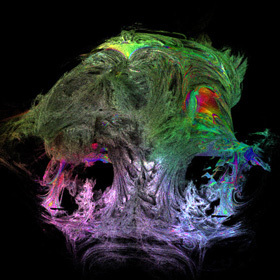 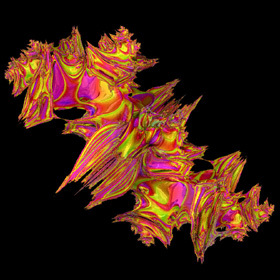 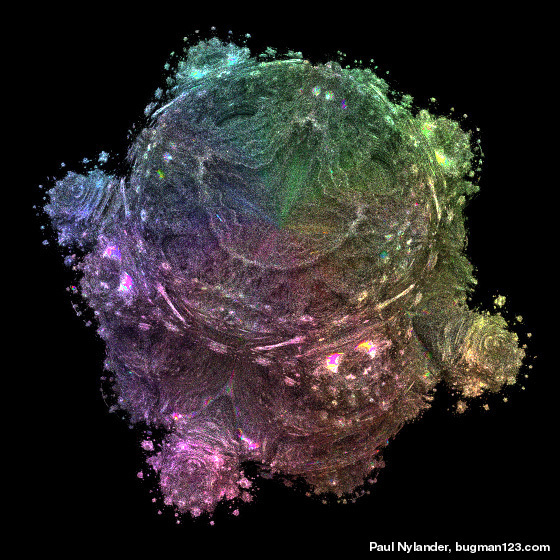 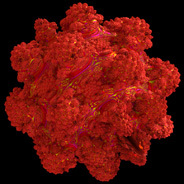 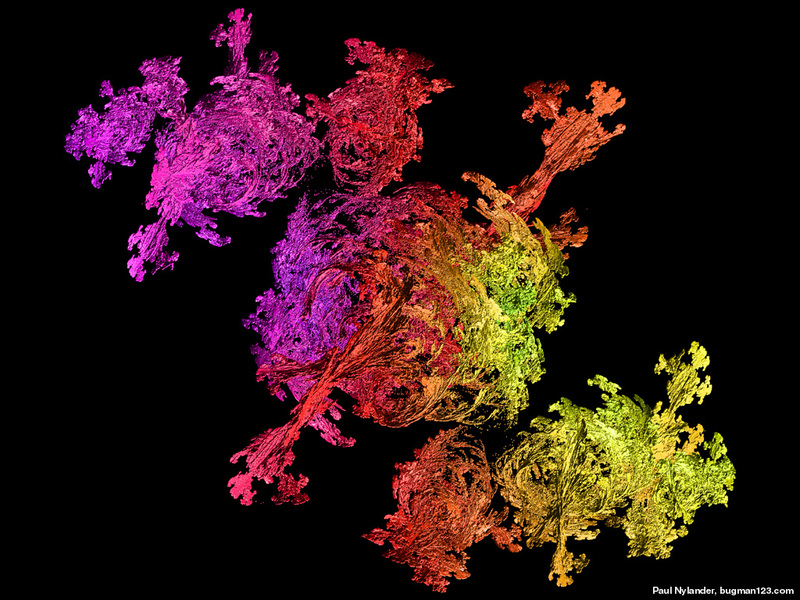 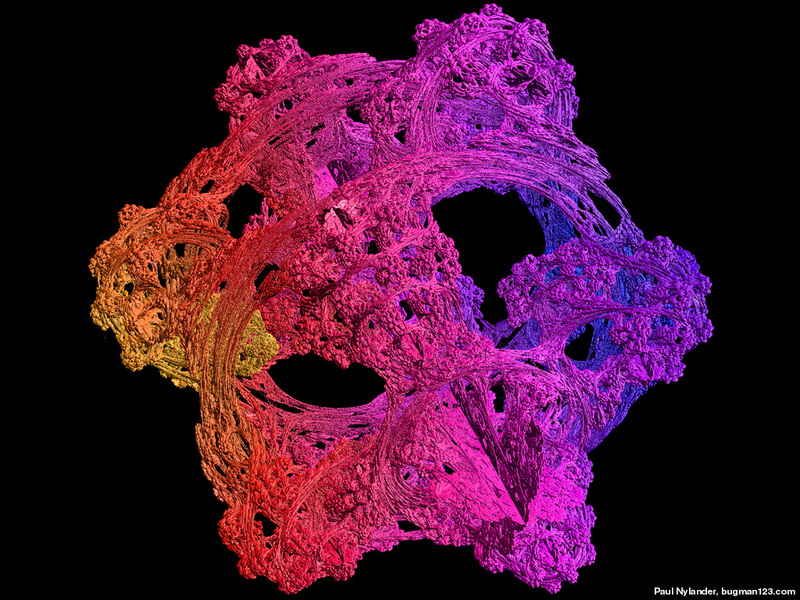 3D Fractals - created by Richard Rosenman using Terry Gintz' QuaSZ software, includes "quaternion, hypercomplex, cubic Mandelbrot, complexified quaternion and octonion"